Receive Westford Weather updates by email. 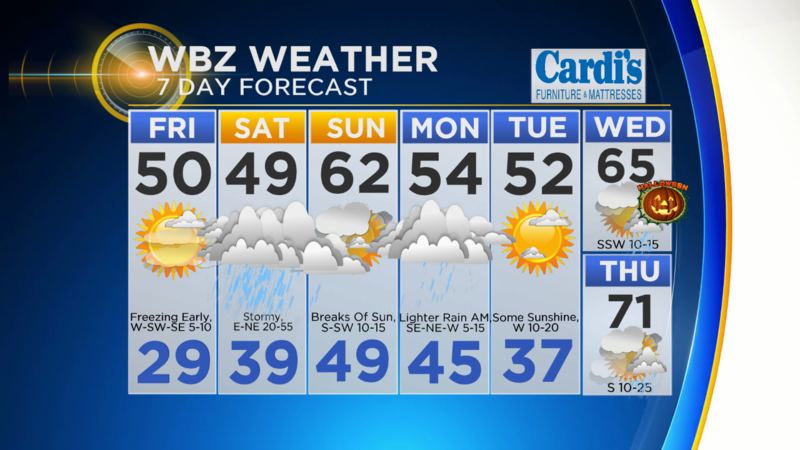 BOSTON (CBS) – Consider it an appetizer for winter. A little nor’easter refresher course before the big tests over the next several months. A windy and wet coastal storm, yup a nor’easter, is headed our way for Saturday. While this storm won’t be nearly as impactful as some of our most recent nor’easters (see last spring), there are a few potential hazards to be aware of. The precipitation will race in quickly late Friday night, arriving first along the South Coast just after midnight. The shield of rain will completely envelope southern New England by dawn and race up into Central and Northern New England during Saturday morning and afternoon. Heaviest rain will fall between 9 a.m. and 3 p.m. with still several hours of lighter precipitation on either side. The rain tapers to showers by Saturday evening and continues (scattered) overnight. By Sunday morning, we will see a steady drying trend and some sunshine emerging in spots. Expecting between 1-2 inches of rainfall on average in southern New England. This will likely cause some brief, localized, urban/poor drainage flooding and street flooding during the late morning and early afternoon timeframe. While there is a chance of some brief, wet snow mixing in Saturday morning, the majority of the snow and accumulation will be confined to elevated areas of New England. Best chance of a few inches in Massachusetts would be in the Berkshires. There is a higher risk of a light snow accumulation in the Green and White Mountains with perhaps as much as 6” in some of the highest peaks. Winds will be gusty all day on Saturday, strongest in elevated areas and along the Coastline. Some pockets of wind damage will occur, exacerbated by the foliage still being on most of the trees. Tides will be running astronomically high this weekend coming off a full moon. Highest risk of coastal flooding will be during Saturday afternoon’s high tide cycle (1:40 p.m. in Boston). Flooding will largely be minor with just scattered pockets of splash over and beach erosion. Seas will build to 10-15 feet just offshore. As always, please stay tuned to WBZ-TV and CBSBoston.com for updates leading up to and during the storm on Saturday. Click here for Westford snow storm data and past totals or select “Winter Snowfall“ under “Pages” on the left hand side.